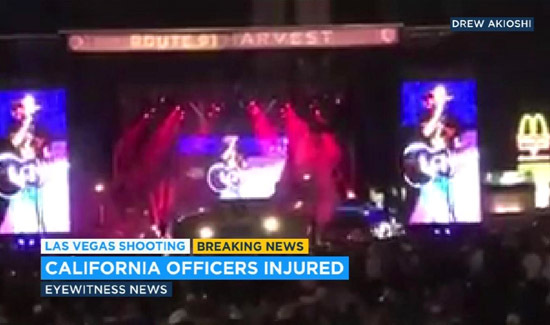 A civilian employee of the Manhattan Beach Police Department was killed and more than a half-dozen Southern California law enforcement and fire department personnel were among those injured in the massacre at the Route 91 Harvest Country Music Festival on the Las Vegas Strip, the worst mass shooting in modern U.S. history. The Manhattan Beach Police Department says one of its employees, records technician Rachael Parker, was killed. Details were not immediately available. A gunman perched on the 32nd floor of the Mandalay Bay Resort and Casino unleashed hails of bullets on fans watching the festival as headliner Jason Aldean performed. Law enforcement officials in Las Vegas said Monday morning at 58 people were killed and 515 wounded by the lone gunman, who was identified as 64-year-old Stephen Paddock of Mesquite, Nevada. Below, a look at some of the Southern California law enforcement and firefighting departments with personnel injured in the shooting. Ontario Police Officer Michael Gracia, 24, was in critical condition after getting shot in the head at the concert. The four-year veteran and his girlfriend were both injured. His girlfriend is expected to be OK. The two have an infant daughter. Gracia started with the police department as a cadet in the jail before fulfilling his dream of becoming a patrol officer. Los Angeles County Sheriff’s Department employees, two Los Angeles Fire Department firefighters, an Orange County sheriff’s deputy, a Los Angeles police officer and two Newport Beach employees, including an off-duty police officer, and were wounded in Sunday night’s shooting. The Los Angeles Police Department officer assigned to the Foothill Division was shot in the leg in the mass-shooting, said Officer Rosario Herrera of the LAPD’s Media Relations Section, adding that the officer was the only LAPD officer wounded in the massacre. “While this appears to be an isolated incident with no apparent threat to Los Angeles, we ask the public to stay vigilant and aware of your surroundings,” according to the LAPD. At least seven off-duty LAFD employees were at the concert, and two of them were wounded, said LAFD Chief Ralph Terrazas. So hard to understand this whole thing. My condolences for the loss of all the victims who were killed and injured in this senseless act of violence!